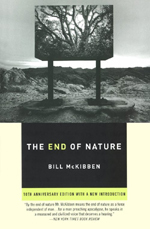 First published in 1989, The End of Nature is routinely cited as a classic work on the environmental crisis. The first account of global warming for a general audience, it is also an argument that we need to take up a very different relationship with the natural world lest we overrun it--and its deep meanings. "If the temperature [is] increasing a degree per decade," McKibben writes, "the forest surrounding my [northern New York State] home would be due at the Canadian border sometime around 2020." And McKibben calls Thomas Midgley, the General Motors chemist who invented both chlorofluorocarbons and tetraethyl lead gasoline additives, the one "who may now hold the record for most banned substances produced by a singled man." He devotes a delightful paragraph to military ruminations over whether global warming, by shrinking the polar ice cap that Soviet nuclear missile submarine use for cover, will confer an advantage on the U.S.